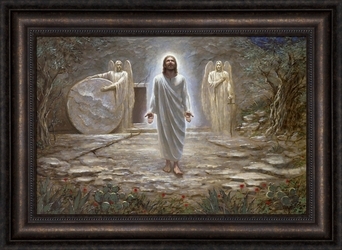 He Is Risen by Jon McNaughton is an incredible piece of Christian art that depicts a risen Lord exiting the tomb that could not hold Him. This special piece of art would make a wonderful addition for any church or home décor setting. 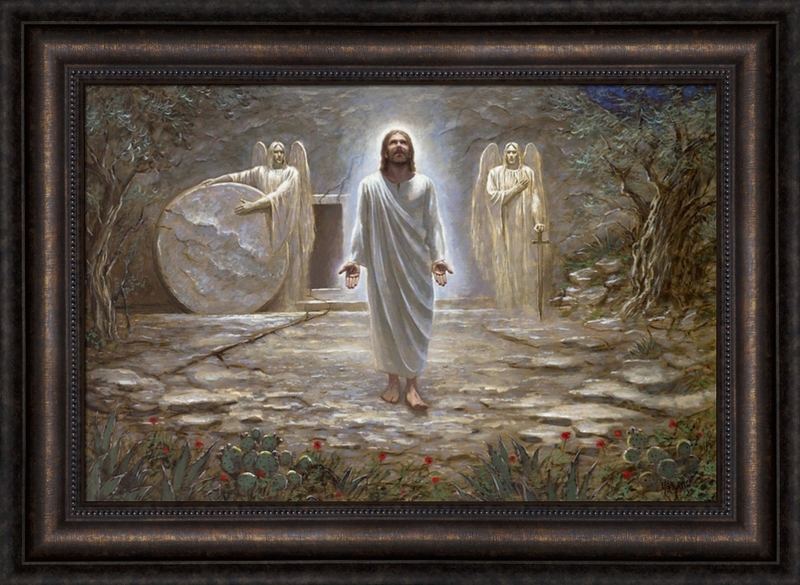 From The Author: I wanted to paint the victorious moment after the angel had rolled back the stone and Christ came forth from the tomb. Standing in His resurrected body, still showing the nail prints on his hands and feet, the tokens that would identify Him as the Savior of the world. The painting in many ways mirrors my previous work titled, “Awaiting the Command” where Christ stands before Pilate as the Roman guards await the command to take Jesus away to be crucified. Some of the same symbols are here in this painting; the angel on the right holds a large sword, symbolic of the cross He suffered. Originally, I had painted Satan hidden in the shadow of the large olive tree on the right, but I painted him out. He doesn’t deserve a place in this painting I thought to myself. You can barely see his image still in the tree. The red poppies remind me of the great drops of blood Jesus shed in Gethsemane as He asked that this cup be removed, but according to His Father’s will. Here, Jesus stands looking upward to Heaven. He has done the will of His Father and has accomplished the single most important event in the history of mankind. It is truly humbling to think what He did for all of us---the Gift that is ours if we will come to Him. 12 options available - see drop down box for pricing.